MacGyver is no ordinary secret agent. He never carries a gun. His drinks aren't shaken or stirred. And he fights for justice using the most dangerous weapon of all: his intelligence. Richard Dean Anderson returns as television's favourite boy scout turned action hero: Angus MacGyver. When an American pilot is shot down over Central America or a top-secret missile is stolen, the authorities call on MacGyver, a former Special Forces agent.. There's never been another hero like MacGyver. Brilliantly brought to life by Richard Dean Anderson, MacGyver is the ultimate all-American good guy. In the action-packed fourth season, old friends and old enemies return to complicate MacGyver's life, including strong-willed Penny (Teri Hatcher), and murderous Murdoc (Michael Des Barres). Not to mention the usual drug smugglers, terrorists, rebels and killers Mac must bring to justice..
One of television's most enduring and popular heroes, MacGyver returns for a fifth season of action, adventure and ingenious inventions. Travel around the world with MacGyver (Richard Dean Anderson) as he fights for the side of right, escapes at the last second and always saves the day. This season offers up some unexpected surprises for MacGyver and his fans: a mysterious trip back in time, an unexpected partnership with his nemesis (M.. When all else fails...call in MacGyver to save the day. Richard Dean Anderson stars as TV's most uniquely likeable her. He can improvise his way out of any trap and out-think any enemy. And in the sixth season, he faces his toughest obstacles. How will MacGyver outwit a serial killer, an unstoppable assassin and an enemy agent who endangers a friend's life? In every exciting episode, the problems are deadly...but the solutions are pure ..
MacGyver The Complete Series – contains all 139 episodes and special features on 39 discs from the American action-adventure television series. With his inventive mind and nice-guy approach, it's no mystery that MacGyver (Richard Dean Anderson) always pulls off the assignment he's given. In the seventh and final season of MacGyver, our hero faces off against criminals with the most outrageous schemes - nuclear terrorists... a mad arsoni.. The classic series is reimagined as the most exciting new show on television! Starring Lucas Till as Angus "Mac" MacGyver, an eccentric genius who uses his unconventional problem-solving skills to save lives across the globe, George Eads as former CIA agent Jack Dalton, Tristin Mays as hotheaded computer hacker Riley Davis, and Justin Hires as struggling film director (and Mac's best friend) Wilt Bozer. Special Features Macgyver It! Th..
He’s everyone’s favourite action hero... but he’s a hero with a difference. Angus MacGyver (Richard Dean Anderson) is a secret agent whose wits are his deadliest weapon. Armed with only a knapsack filled with everyday items he picks up along the way, he improvises his way out of every peril the bad guys throw at him. Making a bomb out of chewing gum? Fixing a speeding car’s brakes... while he’s riding in it? Using soda pop to cook up te..
Get ready for good, old-fashioned adventure. 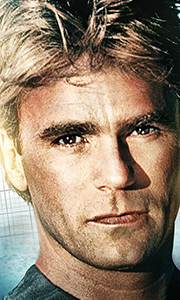 Richard Dean Anderson stars as Angus MacGyver – the legendary secret agent whose wits are his most trustworthy weapon. MacGyver is a one-man unarmed force that can find his way out of any danger using only everyday items he’s picked up along the way. The third season of MacGyver finds him doing what he does best-confronting dangerous foes, overcoming unbelievable odds, and rescuing innocent v..
With his inventive mind and nice-guy approach, it's no mystery that MacGyver (Richard Dean Anderson) always pulls off the assignment he's given. But TV's favourite action hero isn't quite done ... In the seventh and final season of MacGyver, our hero faces off against criminals with the most outrageous schemes - nuclear terrorists... a mad arsonist... even a voodoo priest! Plus a time-travel adventure and an emotional series finale with..
Own Macgyver Season 1 Blu-Ray from Deff, DVD, Blu-Ray & 4K Video Specialists - Free UK Delivery..